One of AnandTech's more in-depth coverage pieces last year was our analysis of the two different version of the Galaxy S9 and Galaxy Note9. Specifically we covered the quite large differences between units offered with Qualcomm’s Snapdragon 845 and Samsung’s own Exynos 9810. 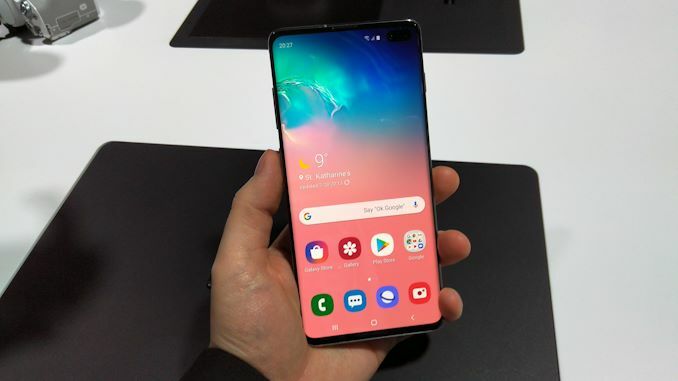 This year again we’re seeing Samsung continue their dual-sourcing strategy in the new Galaxy S10. This time we’re pitting the new Qualcomm Snapdragon 855 against Samsung’s own new Exynos 9820. We were able to extensively benchmark the new Snapdragon 855 back at CES – however we don’t know much about the new Exynos 9820. At last year’s Galaxy S9 reveal at MWC2018 we were able to benchmark the phone immediately after the press event. Unfortunately this year with Samsung dedicating the launch to a completely different event in San Francisco, we weren’t able to get our hands on the units immediately. It took a while, but with the help of some fellow colleagues over at TechRadar, I was able to briefly have access to both units of the Galaxy S10 and run some quick benchmarks. 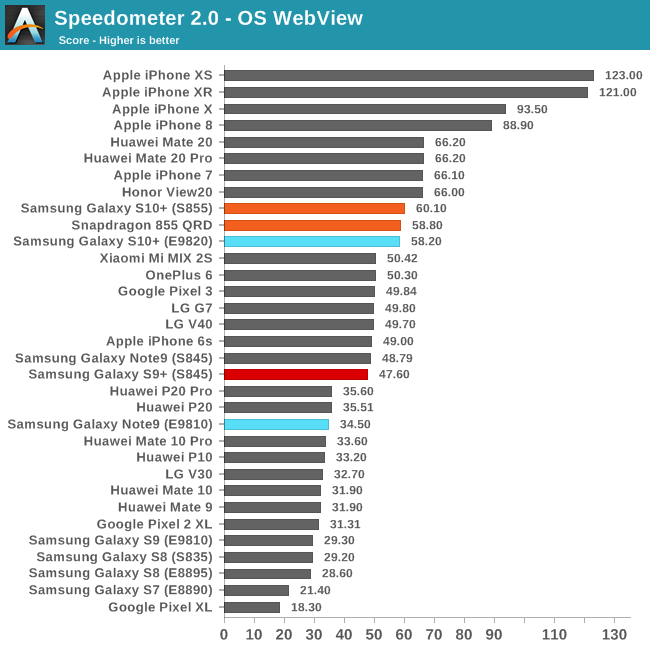 I kept things to a minimum and opted to just run PCMark and Speedometer 2.0 – both benchmarks are some of my favourite in terms of representing the true perceived performance and experience of a smartphone. Both phones were set in performance mode and were running firmware as sampled by Samsung. 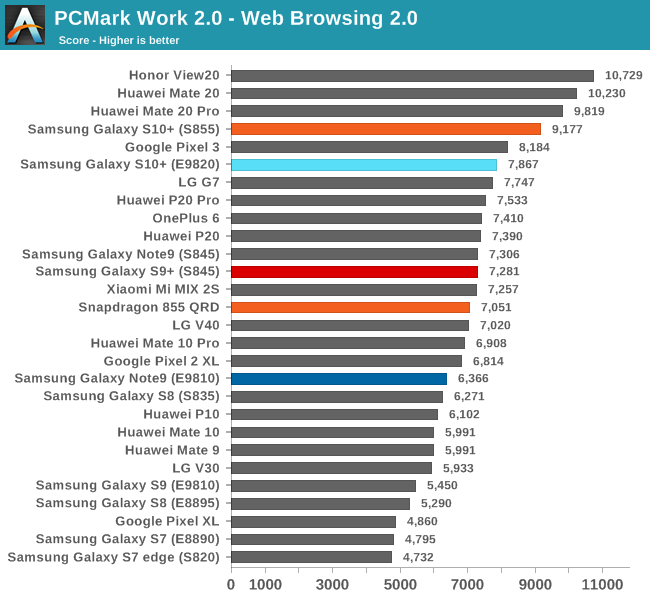 In PCMark’s Web Browsing test, the new Galaxy S10s both perform well. 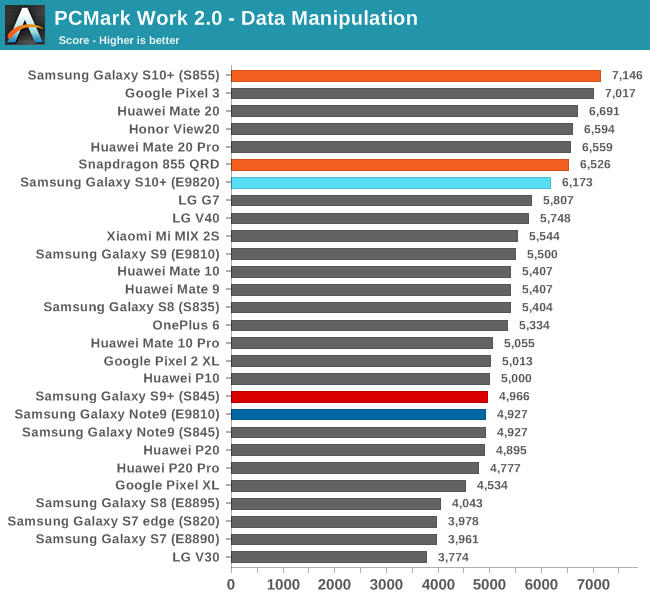 What is interesting to see here is that compared to the scores we initially ran on Qualcomm’s reference device back in January, the Snapdragon 855 Galaxy S10 represents a notable uplift, and seems to be a better representation of the capability of the chip compared to the QRD. It’s to be noted that the comparisons I’m making today are all on the new Android 9 firmwares – I don’t have updated figures for the Exynos S9 or the Snapdragon Note9, but have the latest numbers on the Snapdragon S9 and Exynos Note9, which should be identical to their sister series' counter-parts. The new Exynos 9820 Galaxy S10 now showcases a large performance upgrade compared to last year’s Exynos 9810 units. The new chip’s figures are good and better than the Snapdragon 845, however aren’t able to match either the Snapdragon 855 nor the HiSilicon Kirin 980 – the latter two both based on Arm’s newest Cortex A76 CPU cores. The video editing test is less relevant nowadays as performance differences between different platforms are quite minor. Still the new Exynos still shows a distinct performance difference to the Snapdragon counter-part, similar to what we saw last year. 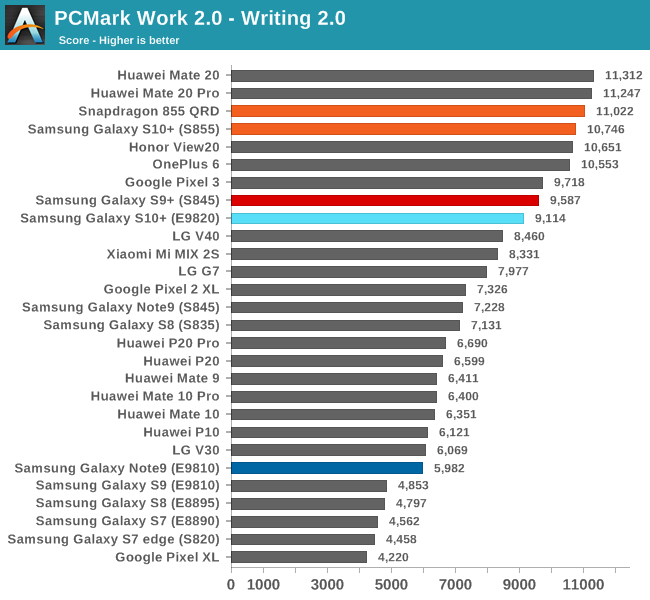 The writing test is probably the single most important component of PCMark when it comes to representing the experienced performance of a device. The Snapdragon 855 Galaxy S10 falls in line with the QRD’s performance, which is excellent. The new Exynos 9820 Galaxy S10 represents a major jump for Samsung, scoring double what we’ve seen on the Exynos 9810 units last year. Likely what this means is that Samsung has solved some of the most important performance issues plaguing the Exynos S9/Note9. The phone still lags behind the new Snapdragon 855 as well as the Kirin 980. We’re not sure if this continued difference is due to hardware or scheduler, and we won’t be able to find out until a more in-depth investigation at a later date. 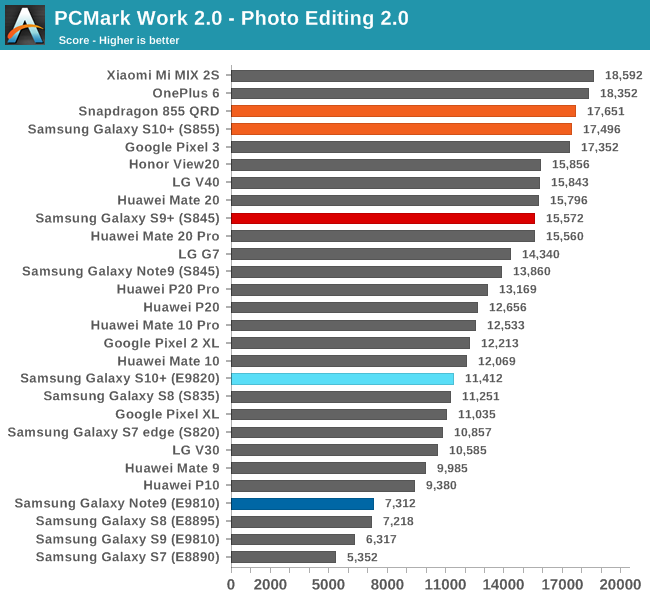 In the Photo Editing test we see the new Exynos 9820 similarly performing almost twice as well as last year’s Samsung silicon. Here it’s clearer that the difference is due to new improved scheduler reactivity as the workload isn’t necessarily throughput limited. The continued performance detriment to the Snapdragon and Kirin chipsets however still points our that Samsung’s APIs still aren’t as well optimised. Finally, the Data Manipulation score is more single-thread limited workload. Here, the new Snapdragon 855 Galaxy S10 takes the top spot among devices. The new Exynos 9820 doesn’t fall too far behind, and does represent a big boost over the Galaxy S9 in either versions. Switching over to a browser benchmark, the new Galaxy S10s both perform almost identically. The performance of the Snapdragon 855 is a bit better than the QRD we tested in January, however it’s still lagging behind the Kirin 980. The Exynos 9820’s performance here represents a huge boost compared to the Exynos 9810. The score presented here not only represents the possibly much better scheduler, but also hardware improvements on the part of the new cluster and microarchitecture designs. Overall the new Galaxy S10s are both in line with expectations. The Snapdragon 855 Galaxy S10’s performance isn’t much of a surprise, as we had covered the chipset in detail at Qualcomm’s performance preview event. The Galaxy S10 actually performs better than the QRD – putting to rest some of the worries we had on the early platform. It’s to be noted that Qualcomm here still lags a tad behind HiSilicon’s Kirin 980 in some aspects, probably a result of the latter’s better memory latency. The new Exynos 9820 performs significantly better than last year’s 9810. Here Samsung seems to have taken note of the scheduler slowness that has plagued the last 3 generations of Samsung SoCs. Besides some obvious software improvements, the new M4 microarchitecture also seems to have upped the performance. 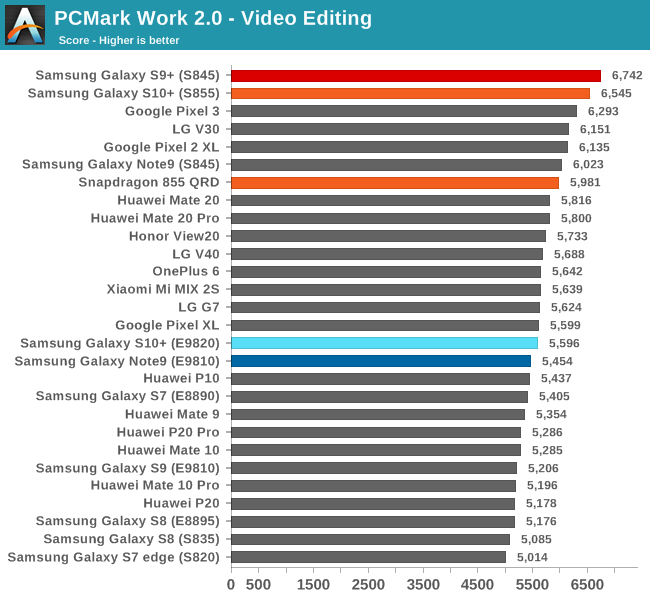 Samsung claims 20% better performance than the 9810, which looks to be reasonable. Today’s results only represent a bare minimum in terms of benchmarking Samsung’s new devices. While the new Exynos 9820 can’t keep up to the Snapdragon 855 in terms of performance, it’s no longer such a stark difference as we saw last year. Most importantly, there’s still one big open question: power efficiency. As we’ve covered in our preview of the Snapdragon 855, the new Cortex A76 derived cores on a new 7nm process node showcase some outstanding efficiency figures. HiSilicon’s Kirin 980 is able to power some of highest endurance flagship devices today, and I expect the Snapdragon 855 to be able to achieve the same. If the new Exynos is able to achieve the same is something we’ll have to find out at a later date. We have to remember that Samsung’s chipset not only has to fix its microarchitectural efficiency issues, but also comes with a process manufacturing disadvantage as the chip is produced on a (theoretically) inferior 8nm process. Unfortunately we won’t have the Galaxy S10 in-house for review until after public availability on March 8th – so we’ll have to be a little more patient before we can post a more detailed analysis of Samsung’s new flagship devices. While I personally detest the practice, it's easy to understand why Samsung does this. They know better than AnandTech the deficiencies of their phones, they don't need AT to tell them. The key point is they don't want AT to tell consumers, because Samsung wants to sell phones. Especially during the launch when consumer sentiment and momentum is at its peak, Samsung doesn't want negative coverage, and so that would be a deciding factor why it would withhold phones from AT. Am I missing something? It just says it's not the fastest. At current levels of performance I doubt that difference can be a dealbreaker for anyone. And if it was then everybody would flock to the fastest SoC.